In the bowl of a stand mixer fitted with the paddle attachment, cream butter and sugars together on medium speed for about 5 minutes, until light and fluffy, scraping down the sides and bottom of the bowl as needed. Add eggs, one at a time, and beat together until thoroughly combined, 2-3 minutes. Scrape the cookie dough to an airtight container, cover and refrigerator overnight (or at least 3-4 hours), or up to a week. To bake, preheat oven to 350 degrees and set a rack in the center of the oven. Line a baking sheet with parchment paper or a silicon baking mat. Drop 1/4-cup dough rounds onto the prepared baking sheet, spacing each about 2 inches apart. Lightly press down on each round with the palm of your hand to flatten slightly. Bake until edges are golden brown and the center is set but still slightly soft, about 15 to 18 minutes. Let cool for about 5 minutes on the cookie sheet, then transfer the cookies to a cooling rack to cool completely. Repeat with remaining cookie dough. Cookies can be stored in an airtight container at room temperature for up to 3 days. The cookie dough can be stored in an airtight container in the refrigerator for up to a week. I'm longing to try these cookies as I read your post! I love the idea of using two kinds of chocolate to enhance the taste. Hi Beth - you know I've seen lots of cookies with semisweet and white chocolate chips or toffee bits thrown in but recently (mainly by accident), I started using more than one kind of semisweet chocolate when I make a batch of chocolate chip cookies and I like that subtle contrast. Now this idea of a bit of milk chocolate is pretty genius, I think. It's subtle but a great trick to adding more caramel flavor to the dough. oh! I love them! They look so scrumptious! These are seriously seriously perfect cookies. They look like you just bought them at the bakery. Hi Monica, I am a big fan of chocolate chip cookies, they are my favorite, will try your version here, like the fact you added bread flour and milk and dark chocolate. Those were the things that attracted me to the recipe, too, Cheri. The milk chocolate - not too much - is a nice touch. I can't get enough of chocolate cookies. These look superb! Great post Monica! The inclusion of the bread flour is interesting. I so know what you mean about trying to achieve the freshly baked artisan cookie at home. Hmm, these look divine. I am going to have to try them out. Have a great weekend! I am always on a quest to find that perfect bakery style cookie too. I think these look just like ones you would find at the bakery- they're gorgeous Monica! I love that you added dark and milk chocolate. I can't wait to try these since I haven't tried this recipe yet - how does it compare to the Jacques Torres' ones? Just can't get that artisan choc chip cookie at home, Kelly! I read somewhere recently that some bakeries use shortening for that texture (...cue my shocked reaction! that just can't be!). Anyway, maybe that's why my favorite homemade cookies are often oatmeal and even whole wheat ones. You don't automatically think of the choc chip cookie from Jacque Torres and wonder why yours didn't turn out like his! I didn't have much luck with that recipe...maybe I should try it again. It made for such huge cookies and I remember mine were soft but not very much like the crazy-amazing one I had at his shop. These cookies with the bread flour is reminiscent of those but I like the bit of milk chocolate here...it's almost like a shortcut to ensure more flavor. Great minds think alike! I just made a cookie recipe from the Flour Bakery book, too, but I have yet to try this one. Yours look amazing, so now I'm intrigued. I'm a firm believer that multiple kinds of chocolate in cookies make them better. Love that! Will swing by to check it out. I'm totally loving the idea of using different chocolates - just even varying cacao % dark chocolates in the cookies make for a really nice contrast, I realized! I am drooling! 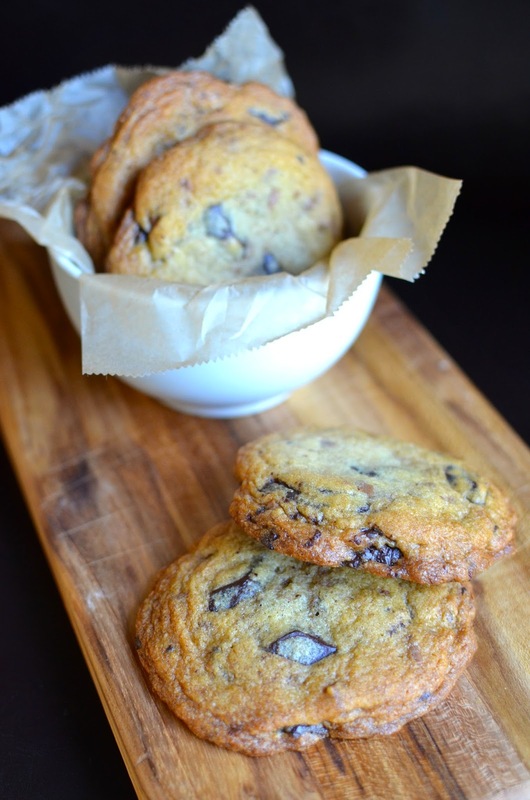 I have a weak spot for choc chip cookies - the fact that you use chocolate chunks makes it sound more irresistable ;)! Love the idea and thanks for sharing the recipe :). These look completely perfect! I'll take a dozen! haha no, not crazy! I love opening containers of baked goods and taking a big whiff!! I'm right there with you! I have been wanting to try bread flour in cookies for the longest time - I need to just do it! These sound fantastic! I'm glad it's not just me! ; ) The bread flour makes it a bit more hefty, almost somehow makes me think it has some whole wheat flour in it...I suppose because of the texture. Definitely gotta try this recipe!!!! It will be a breeze for you! I've been to Flour, and I have their cookbook too! These chocolate chip cookies look heavenly! Gosh, look at these perfect cookies. Honestly, I think I will start calling you cookie master! ha! Mess master, maybe! Thanks, Pamela. So true about milk chocolate Monica! The chocolate of my childhood was always milk chocolate, it is much later that I discovered dark chocolate. And I love it even now. Chocolate chips cookies are the best. A double dose of chocolate can only make them DIVINE! I love this cookbook from Joanne Chang...but yet have to try these cookies...they sure look awesome...very tempting Monica! I'm constantly on the hunt for the perfect chocolate chip cookie - I've made a recipe with bread flour before and loved the results. I'm craving one now! Same here...you can't go wrong with a good choc chip cookie! I like the substance bread flour adds to it. You just totally cracked me up! Oddly, and this will sound crazy to most people, I have never had the urge to eat raw cookie dough! Not sure why...the raw egg doesn't really bother me but cookie dough has never appealed to me. The baked cookie is an entirely different story, of course! I just love that cookbook. I have not tried these cookies yet, but you have inspired me. Thansk! I can understand why there are so many fans of that cookbook. It's got a lot of substance to it and they make for genuine, good, treats from what I've seen so far. Thanks! 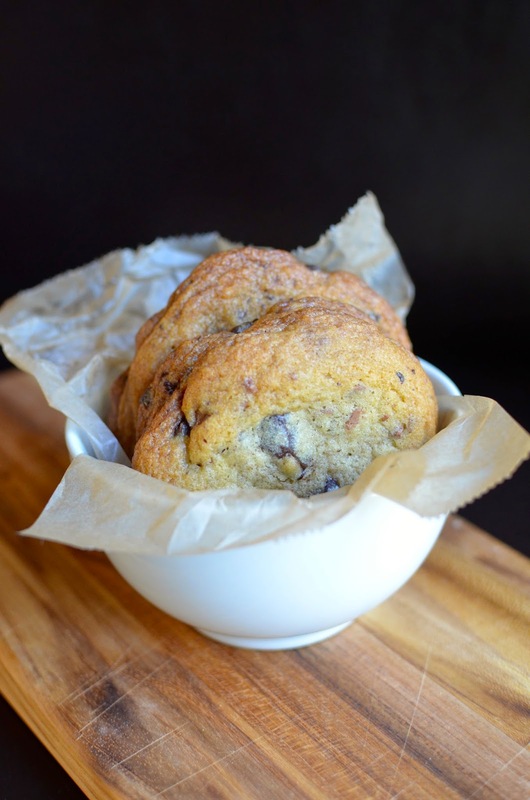 I'm always on the lookout for a new chocolate chip cookie recipe to try! These do look perfect! Those look superb! I've yet to buy any of the Flour cookbooks, but i certainly need to: at least I should test-drive one by adding it to the library list (which i'm going to do right after this, thanks for the nudge!). Interesting about the milk chocolate: i'd like to try that sometime, because i don't think i've ever once used milk chocolate in a cookie recipe. I wonder if achieving the perfect twin to a bakery cookie lies in the oven: i always suspect that's at least part of it, especially if there's a convection oven involved. My microwave doubles as a convection oven (but it's obviously smaller than a real oven, so i don't use it for every day baking), but it's interesting to note the differences in the final product between the two types. I really like some milk chocolate in cookies and maybe that caramel-flavor note working with the cookie dough is a good reason. I've also been highly suspicious/convinced that those confection ovens have a lot to do with the cookie's end result. I have a convection setting on my oven but I'm afraid...I think you need to be making a lot of cookies to get it to come out the way they do at the bakery (or close) but just not sure and don't want to sacrifice cookies for it right now! Ooooh the caramel-butterscotch undertones sound SO enticing! And I would totally do the same thing, open the jar to inhale the deliciousness. I want a cookie!